One-bedroomed Dagli Ev is a charming mix of traditional stone walls, handmade wood and modern furnishings. 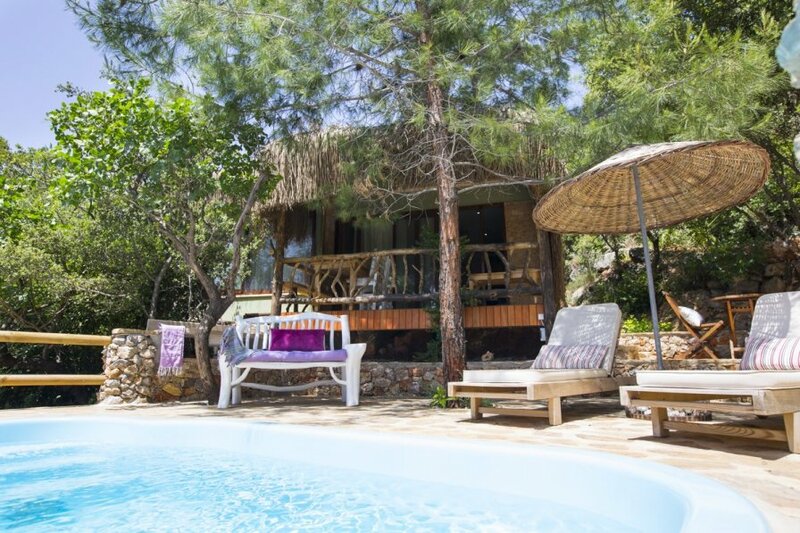 The distinctive Turkish villa, nestled between olive and pine trees. The spacious bedroom looks out over the natural setting, and you'll love the quirky round bed, unique wooden features and characterful nooks and crannies. The wooden cabinets and shelves are handmade and draw on the property's rustic, rural feel giving the feeling of a cabin hidden in the woods. You'll find a comfortable open-plan sitting room with pool and garden views. It's equipped with a dining table and chairs, a comfy sofa and a statement (working) wood burner in the centre. Blending beautifully into its surroundings, this villa is one of Turkey's best-kept secrets. You can reach the entrance by walking under the quaint stone archway, and the grounds are dotted with local plants, trees and shrubs. On the terrace, there's the swimming pool surrounded by sun loungers, and you can sunbathe freely in the knowledge that the villa is entirely private. There's also a balcony with a small wooden table and chairs where you can soak up breath-taking views of the forest as you sip your morning coffee under cool shade. Extra thoughtful features for a hassle-free home-from-home stay include Wi-Fi, air conditioning in the bedroom and a separate space for storing your suitcases. Oh, and we mustn't forget the modern bathroom too. If you'd like to explore the serene surrounds, there are restaurants within a short drive where you can try the local cuisine like fresh fish and meze, or a hearty Turkish breakfast. Sandy Akyaka Beach and the Ciflik bay are close by. Located in the Mugla Province of Turkey, a 1-hour drive from Dalaman, Akyaka is a charming coastal town known for its striking natural scenery, large sandy beach and accredited by Cittaslow for its keeping with local culture. With plenty to offer foodies, nature lovers and architecture buffs alike, it's an ideal holiday location for families with children, friends and couples. The main attraction is Akyaka's beautiful rural surrounds where a multitude of wildlife, including fish otter, herons and flamingos inhabit the wetland conservation area. There are walking routes in the pine forest and along the Kadin Azmak River, where fresh fish are caught, there are plenty of fish restaurants. You'll also find more restaurants, shops and markets between 2-6km from the villa. For outdoor adventuring, Cinar Beach is a short drive away. It's a secluded cove surrounded by forested mountains, with a small creek and a beach bar. You could also take a boat trip from Akyaka to Cleopatra's Beach on nearby Sedir island, where it's said that Mark Antony brought the golden sand from Egypt. Sedir island also has Hellenic and Roman ruins for you to see, including a beautiful amphitheatre, where olive trees have grown through the stones.